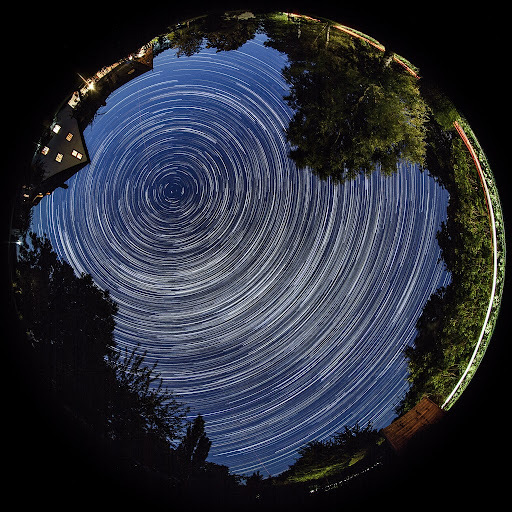 The relatively dark skies and several clear nights on Rügen’s “Muttland” during our recent Berlin-Rügen-Wismar trip had to be portrayed as a star trail, of course. With the new fisheye toy, the camera was just lying on its back on a small table in the hotel garden while we were stargazing. ;-) Result ist the image above, compiled from 264 single exposures at f/4, ISO 400, 30 s (in reality approx. 32 s) for a total time of 8630 s.
Combining the images can be done with a variety of tools. Photoshop or other image manipulation tools, and the “lighten” layer mode being somewhat obvious, but 264 layers with 21 Mpxl would certainly stress resources heavily. So there are some specialists out there: StarStaX and Startrails, both Windows programs offering a “lighten” and a “gap filling” mode among others. For the circular fisheye here “gap filling” is not really required. Nevertheless the result shown above is from StarStaX in “gap filling” mode, as I like StarStaX’s slight increase in local contrast compared to “lighten”. When stacking images in “lighten” mode, both programs will output absolutely identical results. In “gap filling”, I found that Startrails yielded a too bright background for the image series. All in all I tend to prefer StarStaX, even if “comet mode” in StarStaX wasn’t that much of a success. For the stacking, the image series needs to be exported from Lightroom first, JPEGs at max quality are sufficient. StarStaX supports 16 bit TIFFs on input, but not for output. Make sure to check the “Write Keywords as Lightroom Hierarchy” setting, the exiftool command above ensures that the “flat” keywords don’t mess up the keyword hierarchy during import. One big caveat, and I found this out the hard way: in preparing the image series for export from Lightroom, don’t apply any development settings which change the geometry of the image, e.g. crop with rotation or lens distortion correction! Doing so will result in banding-like artefacts in the stacked result! An example of these early trial and errors can be seen here at this image on ipernity (Gröde star trail, artefacts visible in the lower part just above the horizon). This entry was posted in Astronomy, Photography, Tools and tagged astronomy, astrophotography, EN, germany, lightroom, photoblog, rügen, Tools, Travel on 2013-08-25 by mj.